Now that you have gained more skill with breath regulation and body awareness, it’s time to use this while you move. Look at the RECOVERY MOVEMENT diagram below. Click the image below to enlarge. Movement Guidelines Handout – click to download the pdf file. Read through these written instructions to understand the movement guidelines better. Your goal is to move with more ease. First, choose an activity that you believe is safe for your physical body, and that you believe won’t leave you worse later. Start with something small, a movement or activity you can stop when you need or want to—for any reason. You can tackle the harder activities later. Now start the movement, and do your best to keep your breath and your body calm while you move. Keep going, while you divide your attention between your breath, your body, and the movement. As long as you still feel safe, and as long as you can keep your attention divided, while maintaining some calmness to your breath and body, continue the activity. When your breath gets tight or shallow, or when your muscles start to grip, or when you start to wonder if this might not be safe anymore, try one last time to bring softness, and more calm/quiet to your body, mind, and breath—before you decide whether it is time to stop. This will take some practice, and most people need some guidance from a health professional. As you start to gain more expertise with moving with more ease, progress slowly. Even when you push a little too hard, practice calmness in your body, breath and mind while you remember that you are on your way to effectively bringing your skill in pain care into your life. 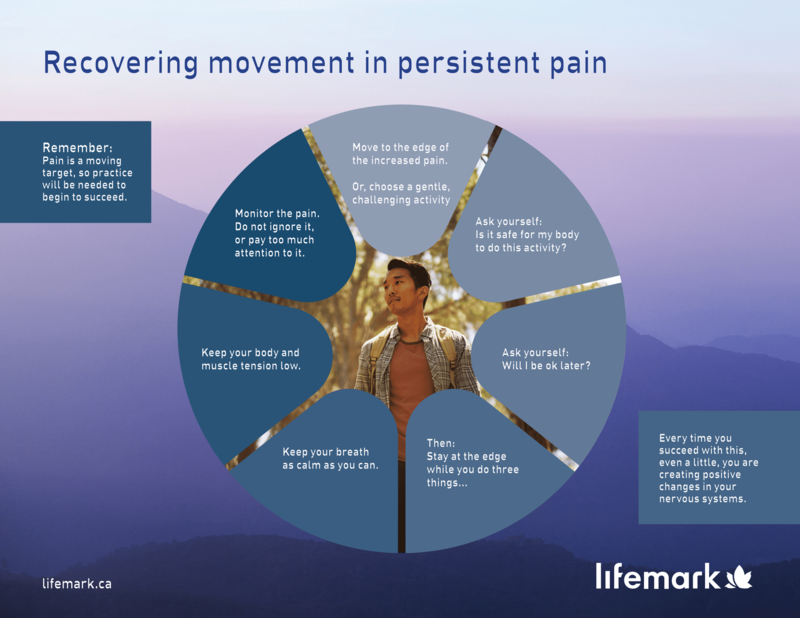 Download our FREE instructional sheet— Guidelines for Moving in the Face of Persistent Pain—to help understand that every time you succeed at moving with more ease, you are creating positive changes in your nervous systems and your body. Move to STEP 5 when you are ready to learn more. Click ‘Next Lesson’ to move one to Step 5.